The “toast” is an age-old, time-honored tradition, where we raise a glass to pay tribute to — and express our goodwill towards — friends, loved ones, and sometimes even our fellow man. They are even known to be meaningfully punctuated by a good drinking song or two. And now, thanks to BizRate.com and Shopzilla Founder Farhad Mohit, there is, as they say, an app for that expression of goodwill. Yes, “cheers” is no longer simply a word that accompanies toasts — or the place where everyone knows your name — it’s also the “world’s first positivity app,” for the iPhone. What am I talking about? Chee.rs, a free iPhone app that launches today on the App Store, was conceived with a simple, altruistic sentiment in mind: To help people express love and appreciation for just about anything and from just about anywhere. While that may sound a little bit sappy, this is meant to be a serious business. The Cheers founder sold Shopzilla in 2005 for $569 million and went on to start DotSpots and Gri.pe (both of which are TechCrunch Disrupt companies). DotSpots hit the deadpool, but Mohit went on to create Cheerful, Inc, bringing Gripe and Cheers together under one roof, behind an impressive team from Google, StumbleUpon, and more. 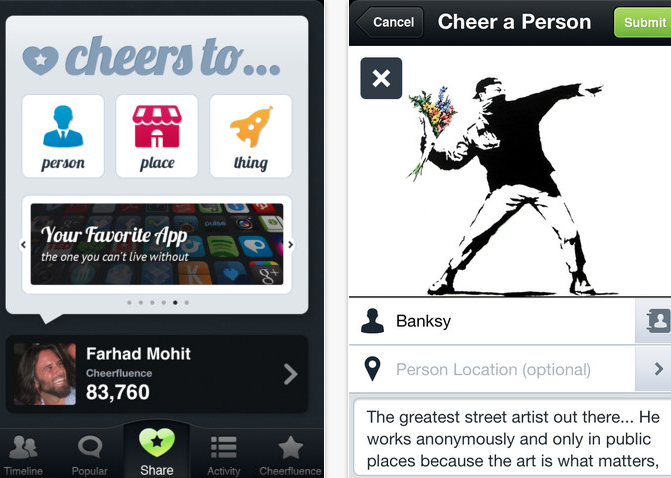 The Cheers founder tells us that the app is meant to be the “Like button” for the world around you, except that it has the potential to be more meaningful because it allows you to create, control, and give voice to each “cheer.” Yes, there are now over 500,000 iPhone apps, and, no, we’re not aware of any apps that celebrate love and appreciation via mobile sharing. So how does Cheers work? When you come across something in your daily wanderings that makes you want to express your love or appreciation (in socially appropriate ways, of course), you open the app, snap a picture, add some appreciative text, and share your cheer. While users are not required to be positive in their messages, nor are they required to snap a photo, the design of the app is tailored toward the inclusion of images. Both positivity and photo sharing are “highly encouraged,” the founder says. Once a user shares their cheer, they can blast it out on Facebook, Twitter, via email, and on the Web, watching as it spreads across their social circles. Friends and other users can “like” the post or comment and reciprocate. Creating a Cheer takes less than 30 seconds, and users can create Cheers around people, places, or things, as Mohit says that he wants to keep the use case as broad as possible, to encourage engagement and sharing of restaurants, movies, books, friends, pets, and so on. The app also contains its own user rating system: In other words, the more you cheer, the more “Cheerfluence” you accrue, allowing other users to track the extent of your social cheerleading. There’s been a lot of talk in the mobile space centering around serendipity, and the potential that location-based mobile services have to help you find something you’ll enjoy even when you’re not looking for it. While Cheers has the requisite location layer baked in, it’s not an explicitly location-based service. But it still has some of those elements of serendipity, as Mohit cited the example of sharing a Cheers about a particular person, which was then commented on by an old friend. Through this Cheers, he was able to reconnect with that person. In that way, Cheers intends to connect people, and facilitate discovery of things you’re likely to enjoy based on affirmations of similar interests and experiences. Those checking out the app may also notice that the app looks similar, design-wise, to some other popular social and discovery-based mobile apps. Kevin Rose’s Oink comes to mind. Mohit says that Cheers was being developed at the same time as Oink, but the real inspiration came from Instagram’s model of photo sharing. The more jaded among us may find reason to scoff at this mobile love fest. Maybe it’s the approach of Valentine’s Day, but I think there’s something to be said for lowering the barriers to sharing appreciation for our favorite people, events, and entertainment in an environment dedicated to making tributes. Cheers is still very early in its development, as Mohit says that there’s plenty left to be done in terms of better tapping into Facebook “likes,” increasing activity on the app itself, the ability to link to other Cheers, better browsing, and upgrades to the camera functionality, (like including a flash). These are all things slated for future upgrades, along with developing apps for other mobile platforms. 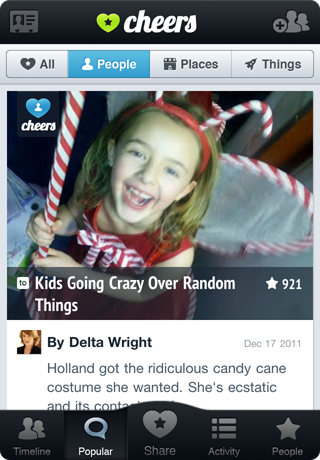 The app has a ways to go before it reaches the tipping point, and it remains to be seen exactly how Cheers will monetize, though there is some definite potential around enabling local businesses to tap into users who blast out Cheers for their services, or branding of users with high “Cheerfluence” scores, for example. Either way, it’s probably still worth raising a glass to sharing the love. For more, check out Cheers at home here. Then come on back and let us know what you think.